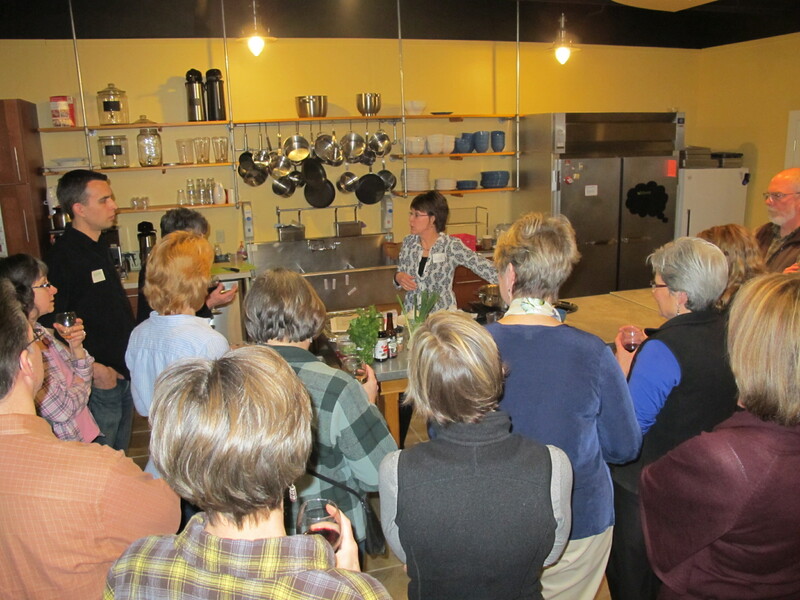 At our last supper club, we had some wonderful demos to expand our cooking repertoire. 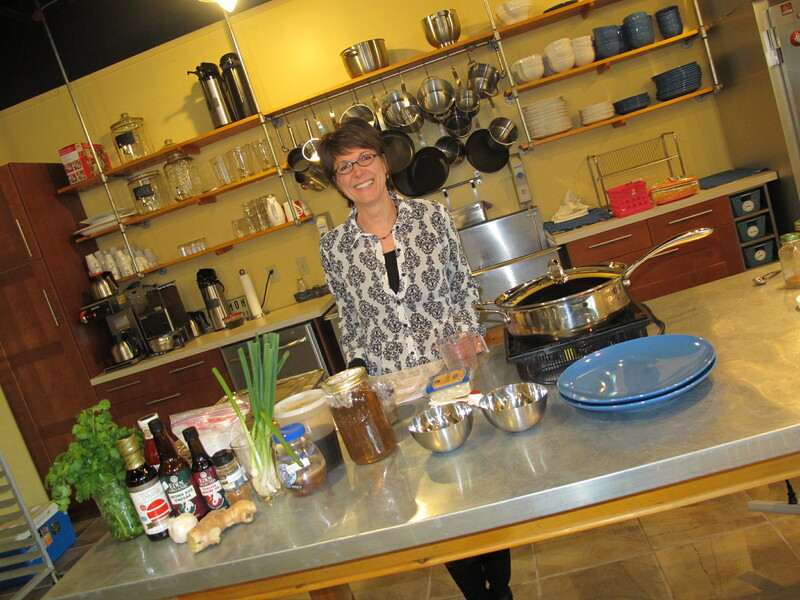 Laura Johnson, a plant-based chef from Impact Health in Holland, demonstrated how to make mushroom potstickers. Thank you, Laura, for the great demo! Slice green onion, separating white from green. Remove stems, finely chop mushrooms and place in large bowl. Press garlic and let rest. Mix soy sauce, corn starch and five spice powder in small bowl. In a large pan heat oil and add garlic, ginger and white parts of scallion. Stir immediately to prevent burning and cook for 1 minute. Add mushrooms, stir and cook until most of liquid is gone. Once mushrooms are cooked, clear a space in the middle of the mushroom and add the soy sauce mixture. Add 2 Tbsp of hot broth and allow to boiled for a few seconds before stirring mushrooms back in. Add green parts of scallion, stir and heat for a few sends. Remove mushroom mixture from heat and place in large bowl to cool. Bring 2 cups water and mushrooms stems to boil. Simmer for 30 minutes. Filter mushroom broth through coffee filter or fine sieve. Place all ingredients in a small pot and heat until barely simmering. Serve in small individual bowls. Get a small bowl of water to wet wrappers. 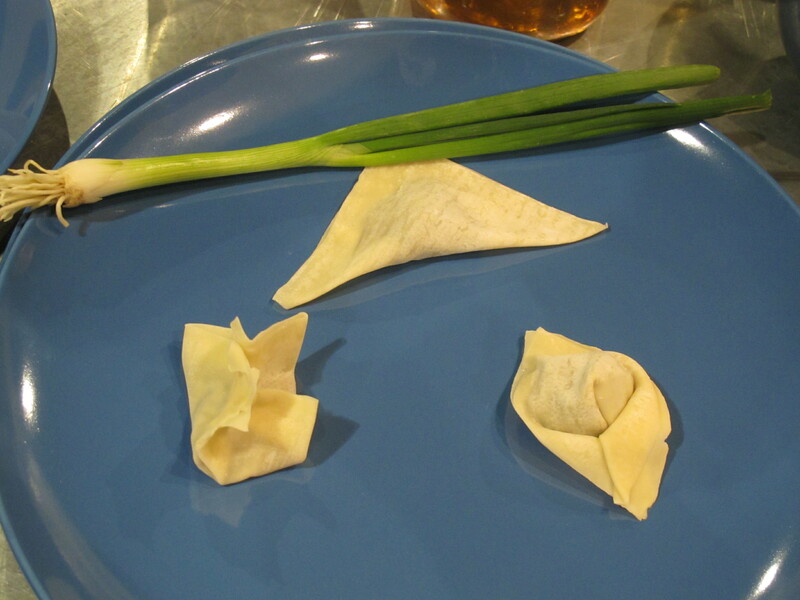 Keep wonton wrappers that you are not using covered with a damp pager towel to prevent them from drying out. Lay one wrapper on a clean plate and dip finger in water and wet edges of wrapper. Place about 2 tsp of mushroom filling in the middle of each wrapper. Fold two opposite corners to make a triangle. Seal edges by gently pressing them together. Cover finished dumplings with a damp paper towel as you work. In a large pan add a small amount of oil, heat and arrange potstickers in a single layer. Cook until golden brown on each side. If cooking multiple batches use a little oil between each batch to help prevent sticking. Once golden brown on both sides, add 1/4 cup mushroom broth to pan, cover with lid and steam for several minutes until most of the broth is gone. Carefully remove potstickers from pan (they may stick a little, hence the name) and place on a decorative plate and serve immediately. Note: May skip browning part and just steam. May use other mushroom combinations of choice!